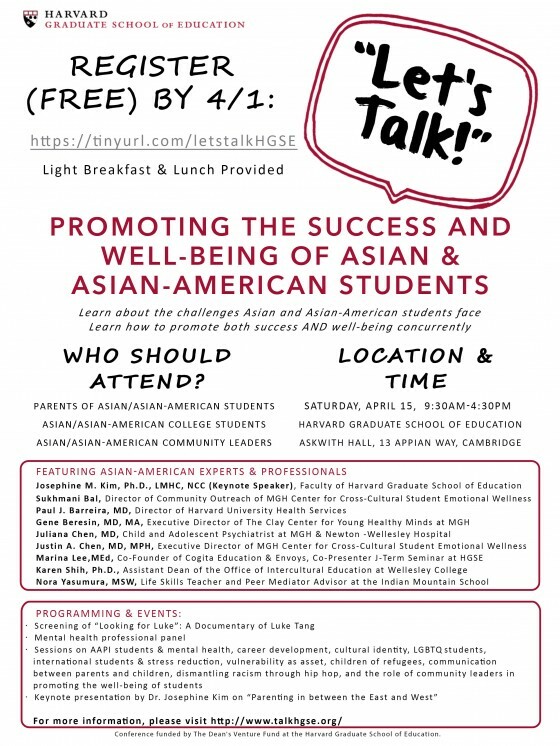 We invite Asian and Asian-American parents and college students to the Let's Talk! Conference, which will take place at the Harvard Graduate School of Education on Saturday, April 15th from 9:30am to 4:30pm. The Let’s Talk! conference is a free gathering for parents, college students, and community leaders of Asian descent who seek to explore ways of promoting both the success AND well-being of Asian and Asian-American students. Please see the attached flyer for details about the full program, exciting lineup of speakers, and registration information. If you have any questions, please contact the Let's Talk! team at letstalkconference@gmail.com. We invite you to share this learning opportunity with others who might benefit. Thank you.